Whether you’re a natural food manufacturer or a food service distributor, finding the right supplier for your goods can be a tedious process. We talk a lot about the different grades of olive oil: how they’re made, what they’re used for. But, it’s been a while since we talked about Organic Extra Virgin Olive Oil in particular. Sometimes, organic EVOO seems so straight forward that it’s easy to glance over. This week, I’d like to bring it back to this classic, premium (and my personal favorite) oil. Here’s some basics about Organic Extra Virgin Olive Oil that you should know. Olive oil shelf life is truly a important thing we need to be aware of. Every distributor may have a different answer for you in regards to how long they suggest olive oil to last for. As for Centra Foods, our oils have a shelf life of 2 years (or 24 months) which is based on the date of manufacturing. Here’s more about what you need to know about the shelf life of olive oil and why it’s so variable. Why Are Safflower and Sunflower Oil So Popular In The Natural Food Industry? The popularity of safflower and sunflower oil have skyrocketed in natural food products in the last five years. Of course, before then, these were always oils that were both used occasionally — they just weren’t as popular to the same extreme that they are now. With the recent trend towards natural and premium ingredients, these two oils have struck a chord with the natural food crowd. They both contain characteristics that natural food manufacturers want to include in their products. Below, we’ll review each of the different features of these oils that makes them so likable. There’s so much misinformation about canola oil out there. Part of the problem is that the issues people find with it are only sometimes true. To understand the full story, you have to know when the claims about canola oil are actually true and when they are false. Today, I’ll be tackling some myths and truths about non-gmo canola oil in particular, and how they relate to their conventional and organic counterparts. As a fan of great leadership, I’m always looking to books on business growth, personal growth and leadership to move our company forward. Many natural food brands are in the same situation: they are often young companies, with fast growing teams that need good leadership to succeed. Because I know many of you have the same interests — growing your company and building a strong food manufacturing team — we may find that the same books can help us grow. Below is a list of some of the top recommended business and leaderships books. 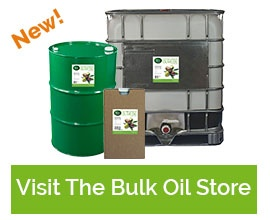 There are lots of different ways you can dispense oil from bulk packaging. Most options will require some sort of dispensing system. As you are comparing bulk packaging options, it’s always helpful to understand how you well get your oil out once it is in your facility. In this article, you will find out how to dispense from the three most common bulk oil packaging options (35 Lb. Containers, Drums and Totes) whether you are pumping into smaller bottles or if the oil is being used as a batch in your food manufacturing. These different options are all machine-free, low-cost, easy to use, and take up practically no facility space. Organic vs. Non-Organic Oils: Are They Really That Different? Across the board, are ALL oils really that different when you compare the organic vs. the non-organic versions of them? Is organic extra virgin olive oil that different from regular extra virgin olive oil, or organic canola oil that different than regular canola oil? The answer really depends on the oil, and requires that we dive a little deeper. Are you wondering if you can use a drum pump in both steel and plastic drums? Well, the answer is yes! And even better, you can use the same pump in both types of drums. Let me break down for you how easy it is to use. Is There Really A Low Fat Olive Oil? Is there such a thing as “light” olive oil? To answer this question, you have to start with defining which type of “light” you are referring to. Olive oil described as “light” does not mean that it is a low fat oil. What makes it a “light” oil is actually the particular grade of oil: “Extra Light Olive Oil”, “Light-Tasting Olive Oil”, “Extra Lite Tasting Olive Oil”. All of those terms refer to the type of oil inside, not that it is low fat.